Far from the cheapest headstock tuner, but aside from that polyphonic display, it's extremely accurate and rather cool! Very accurate. Wide jaws fit all kinds of headstocks. Expensive for a headstock tuner. Some issues when using polyphonic display. The Clip is the world's first polyphonic headstock tuner. 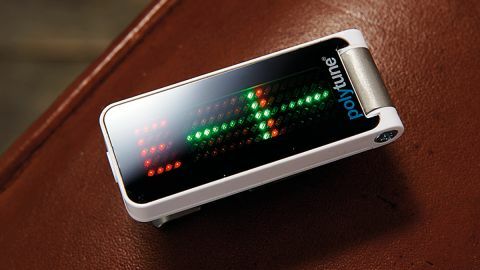 Based on the PolyTune pedal tuners the Clip is little longer than a nine-volt block battery, about half the thickness, and is attached to a stainless steel clip with rubber pads designed to protect the headstock you clip it to. Its jaws are wide, too - even thick classical guitar headstocks are no problem. The tuner moves through one plane - it doesn't swivel 360 degrees - but the display does reorientate depending on if you have it on the face or rear of your headstock. In PolyTune style, you strum all the strings to instantly tell which ones are sharp or flat. When you start tuning the individual notes it displays in either needle chromatic mode (with an accuracy of +/-0.5 cent), or the strobe mode (+/- 0.02 cent). You can change the standard A440 reference and you can switch to bass mode (not polyphonic). The only oddity is that when you've tuned up according to the chromatic or strobe displays, the polyphonic display says you're still not 100 per cent in tune.